Kailash Sankhala gets Rajasthan Ratna Awards 2013. 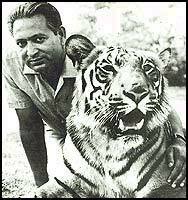 Kailash Sankhala (1925–1994) was a renowned naturalist and conservationist of India. He was the director of Delhi Zoological Park and Chief Wildlife Warden of Rajasthan. Born on 30 January 1925 he is best known for his work in preserving tigers. He was well known around the globe as the Tiger Man, and was involved in the formation of Project Tiger, the world's largest wildlife conservation programme set up in India in 1973.